In fact, this brave deputy superintendent of police (DSP), belonging to Punjab Police, is Gurmit Singh Kingra. According to local media reports, this Bathinda-based cop is a professional swimmer. 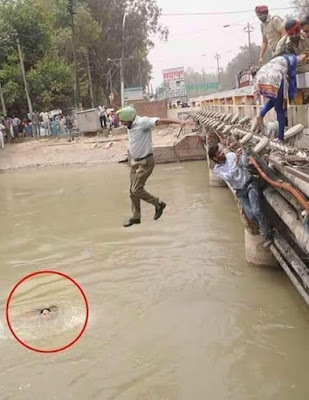 An assistant sub-inspector Kaur Singh also jumped into the canal when he saw his boss Kingra did it to save lives. The incident took place on July 5 this year, i.e. almost a month before this photo created a buzz in social media on Sunday. Demanding regularization of their jobs and raise of Rs 5,000-a-month salary to an appropriate level, around 500 teachers protested on the highway in Punjab’s Goniana near Bathinda, prompting police to lathicharge. As a local news channel showed, protesters blocking the highway were dragged and taken into custody by police. It could not be ascertained from available videos whether the lady protester in the picture actually jumped fearing police, but The Tribune headlined the incident like this: “Fearing police, teachers jump into canal”. A police officer in the same news report denied any excesses meted out to protesters. But what can’t be undermined by any means is the brave act of this cop who has turned inspirational for his colleagues across the nation. “I've no word to express what i feel right now!! Salute! just salute! !” – is how a reader reacted in Twitter after seeing this photo. Quips another: “par phir bhi log isko Thulla kahenge (even then people call cop a Thulla), clearly taking a jibe at Delhi chief minister Arvind Kejriwal’s recent derogatory remark on police. Someone said, “Singh is King”. 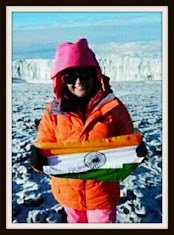 And many people wrote: “Jai Hind”. Another reader says what could be comparable to an editorial comment, “corruption and nepotism abound but officer such as these keep hope alive”. Yes, they do.